This is not cookie sorcery. But it’s darn close! No one can resist the pumpkin cookie. NO ONE. This one is definitely calling your name…and their name…and their name. For the past month I have passed by that bakery table at the grocery store and every-single-time I see those pumpkin cookies, they are calling my name. I think to myself that I’ll just buy the ingredients and make them when I get home. That hasn’t happened for a month now. What was I thinking?!! These are so easy to make. Oh boy, do I regret not making these sooner. This has to be the best pumpkin cookie recipe out there. It’s a super moist, cake-like cookie with a lot of pumpkin flavor. So much spicy, witchy goodness that you might not even need the icing…or do you? 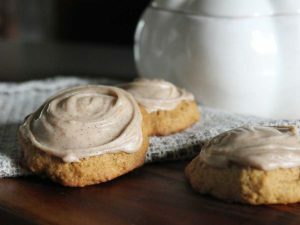 The toasted butter icing gives it a nice, nutty flavor – without adding nuts. I’m not an allergy expert, so please use that note with caution. The toasted butter was a happy accident. I melted the butter on the stove instead of using the microwave like I usually do. During the process, I decided to toast (brown) the butter so it had that nutty taste to it – or at least that is what I was hoping would happen. I was not disappointed! The combination of the spices with the nutty icing is perfection. So glad I tried it! Scroll down to print the recipe or Pin It for later. And have I mentioned the flavor? I’ve had some really bland pumpkin cookies in my days. These are not them. In a large bowl, cream the butter and sugar until light and fluffy. Beat in the pumpkin, vanilla and egg until thoroughly mixed. In medium size bowl, combine the flour, salt, baking powder, baking soda, cinnamon, ginger, nutmeg, and cloves. Gradually add that to the large bowl and mix well. Drop about a tablespoon size of the cookie mix onto a coated cookie sheet, about 2 inches apart. Bake for 12-13 minutes until lightly browned. Transfer to wire rack to cool. In a small bowl, combine sugar, milk, vanilla and cinnamon. Use a small sauté pan and heat butter on medium high. Butter will bubble and then start to brown. Watch closely until butter starts to brown. About 3-4 minutes. Promptly remove from heat and carefully add to the bowl with the sugar. Spread icing over cooled cookies. Sprinkle with cinnamon or raisins on top, if desired.